What Can Managers Do to Mitigate Violent Employee Behaviors? Succession planning is an investment in leadership training, and must begin in lower levels of the workforce. Leaders must prepare for succession to harness workforce costs and national security. Managing human capital in the federal workforce is a challenge that has plagued presidential administrations and Congress for the past three decades. Significant issues such as homeland security threats, fiscal imbalances, generational differences, and disruptive technologies have caused senior leaders to rethink the traditional management approaches in use since the industrial age. In addition to these human capital issues, reports by the Partnership for Public Service indicate that nearly half the federal workforce is eligible for retirement in 2016. Experts have described these impending retirements as "the perfect storm," a "workforce tsunami," and a "brain drain" to name a few. Benjamin Franklin said it best when he stated, "by failing to prepare, you are preparing to fail." By tapping into knowledge management and understanding the distinctions among generation cohorts, managers can connect the dots between succession planning, human capital management, strategic planning, and fiscal responsibility. Succession planning is about having the right people in the right jobs at the right time, and having successors in place with the ability to lead and develop competence. Management consultant William J. Rothwell suggests that the discipline is "a deliberate and systematic effort by an organization to ensure leadership continuity in key positions, [while] retain[ing] and develop[ing] intellectual and knowledge capture for the future, and encourag[ing] individual advancement." The core principles of knowledge management in the federal workforce involve capturing, evaluating, retrieving, and sharing information in a way that encourages collaboration and team building. On the surface it may appear that these principles are general management practices. However, few human resources managers report that knowledge retention is a high priority within their organizations, even as they acknowledge that significant portions of their current workforce will be eligible for retirement over the next 10 years, according to the Society for Human Resource Management (SHRM). This suggests that implementation of knowledge transfer and knowledge capture as part of succession plans is not a priority. Conversely, some agencies have taken proactive steps to engage in knowledge management through the use of databases, codification (information governance), and communities of learning. Figure 1 displays the flow of knowledge in federal agencies. There are approximately 1.9 million federal employees in the executive branch across the United States and abroad. This workforce is comprised of four generational cohorts. Each of these cohorts has distinct work styles; understanding the styles and other values of each age cohort is a vital element of succession planning. 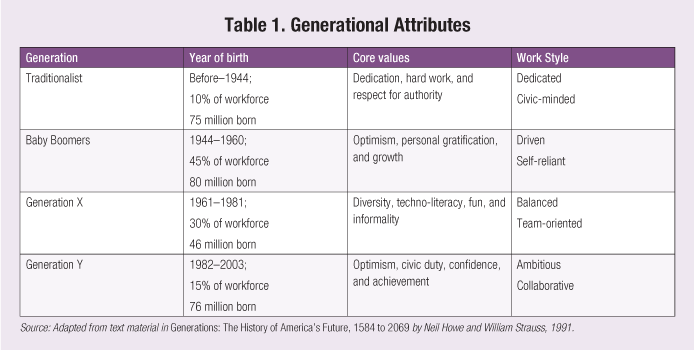 These cohorts are the Traditionalists, Baby Boomers, Generation X, and Generation Y (also called Millennials). This is the first time in our nation's history that four cohorts have worked side by side. Merging the philosophies of these generations to meet agency missions can prove to be difficult. While there are many variances between the cohorts, one common theme among these employees is their desire to make a difference through public service. Table 1 notes some distinctions among the cohorts. Preparation for the next generation of employees is essential to the stability of the federal workforce. In 2012, as part of research for a study on succession planning at federal agencies, our team surveyed managers affiliated with the Federal Managers Association. The results of the survey indicated that 54 percent of federal managers did not know if their agencies had succession plans. Additionally, the majority of the respondents believed that key management successors have not been identified, and that leadership development programs should begin earlier in an employee's career. 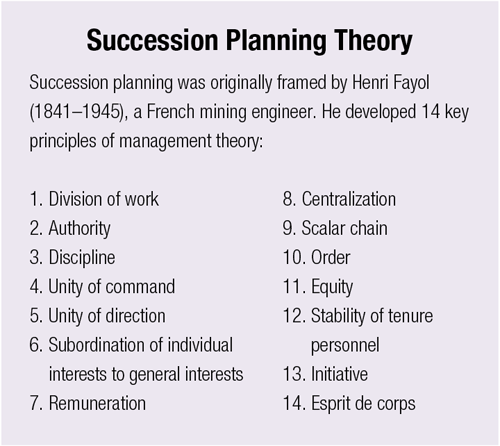 There is a cost to failing to plan for succession. The study also found that failing to prepare for succession will ultimately increase the total federal workforce costs and pose a threat to national security. One example of this comes from the 9/11 Commission report, which details how our government's failure to put the right people in the right jobs contributed to major security lapses. The Government Accountability Office has put human capital management on its "high-risk" list of the most pressing challenges facing our government. Failing to prepare for succession may increase human capital expenditures by 30 percent, totaling some $21 billion over the next 10 years, based on figures in a report to congress submitted by the Project on Government Oversight (POG). The connection here is that when employment freezes are imposed by congress, historically federal agencies rely on service contracts to fill the gap to meet agency missions. POG notes that it cost 1.83 times more when contractors perform work (outsourcing) instead of government employees. Senior federal leadership must examine the hidden costs (financial and organizational) associated with failing to prepare. They also should consider including succession planning as part of their agency's strategic plans to highlight the importance of investments in leadership training, coaching, and mentoring earlier (beginning at GS-9 instead of GS-14/15). This initiative could save federal agencies approximately $10.6 billion over the next 10 years. Managing human capital and talent management in the federal workforce requires an interdisciplinary approach to meet agency missions. Utilization of succession planning, knowledge management, and generational cohort theories will enable agencies to adequately prepare for a transition in the workforce. Raymond Marbury, DBA, MPA, is chief executive officer of Education Institute of Capitol Hill, LLC (EICH) and a program manager with the federal government. EICH specializes in coaching, training, and consulting in the Washington D.C. metropolitan area. Roger Mayer, DBA, CPA, CIA, CRMA, is audit director at New York City Health and Hospital Corporation. He is also an instructor and doctoral study mentor at Walden University.